A lot of slides have come through the scanner recently showing scenes from the southeast corner of New York State -- the Hudson Valley and along the Southern Tier over towards Binghamton. Let's take a look at some of these chromes, and we'll do them in chronological order. Starting things off (above) we're in Manitou, just north of the Bear Mountain Bridge over the Hudson River. 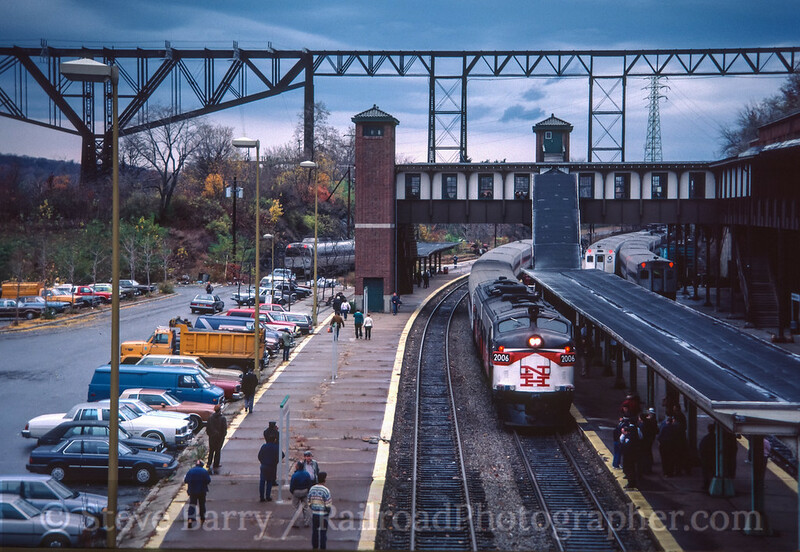 A late spring has a lot of bare trees showing on April 30, 1983, as Amtrak's Lake Shore Limited splits a set of ex-New York Central signals. For our next shot we continue up the Hudson Valley to Poughkeepsie. Metro North Commuter Railroad (it has since dropped the word "Commuter" from its name) in conjunction with the State of Connecticut had rebfurbished and repainted some FL9 locomotives into the old paint scheme of the New York, New Haven & Hartford Railroad (the New Haven). 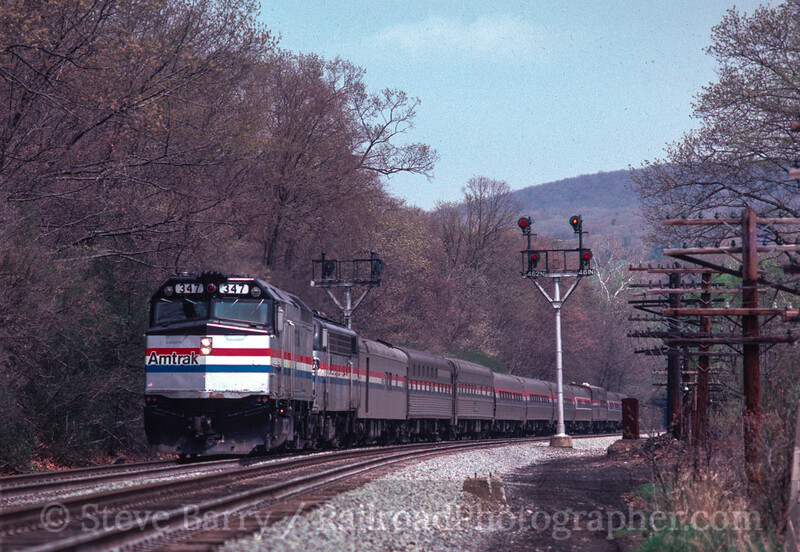 A pair of the FL9s were used on a fan trip on November 9, 1986, that went from New York City's Grand Central Terminal, out the former New Haven to South Norwalk, Conn., then up the Danbury Branch to Danbury, Conn., and over the Maybrook Line to Poughkeepsie (EDIT: The Maybrook Line comes out at Beacon ,s oI don't know how we got to Poughkeepsie, unless this was a GCT-Poughkeepsie trip. Hmmmm.) The train is about to finish the trip by heading down the Hudson Line back to Grand Central. The former Lehigh & Hudson River Railway bridge over the Hudson sits silently -- it had burned in 1974 and no trains had used it since. It is now the popular Walkway Over the Hudson trail. The New York, Ontario & Western Railway was abandoned in 1957, the largest railroad in history to have been abandoned at that time. The line has always had a fanatical following, even in death, and the O&W Railway Historical Society celebrated its 25th anniversary in style in 1988. The railroad's (and society's) headquarters was Middletown, N.Y., where the line's massive combination station and office building survives. 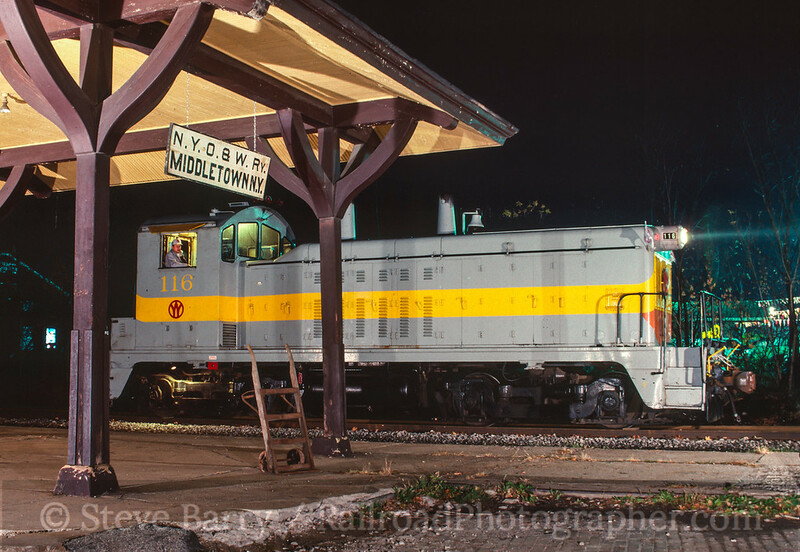 For the anniversary, the society borrowed an ex-O&W NW2 diesel owned by the New York, Susquehanna & Western (and painted in O&W colors) and posed it at the old station for a night photo session on November 4, 1988. The original station sign and baggage cart were brought out from the society's archives to complete the scene. Moving northeast of Binghamton, we come to the Delaware & Hudson Railway. The D&H had been operated by Guilford Transportation for a few years when suddenly Guilford simply decided to stop running it in 1988. The New York, Susquehanna & Western was tabbed to step in and run the railroad, and run it they did. 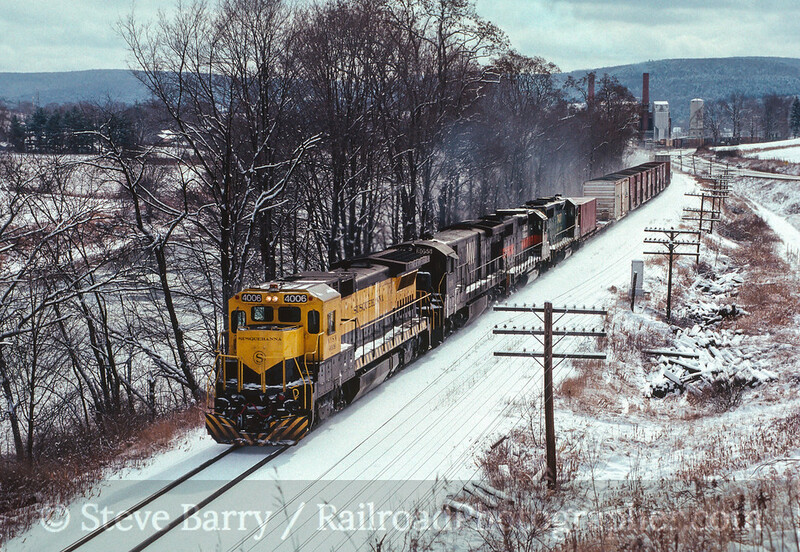 Here we see a Susquehanna freight heading north up the D&H and Bainbridge on a wintry day in February 1989. Later that year the O&W Railway Historical Society (remember them from a few photos ago?) 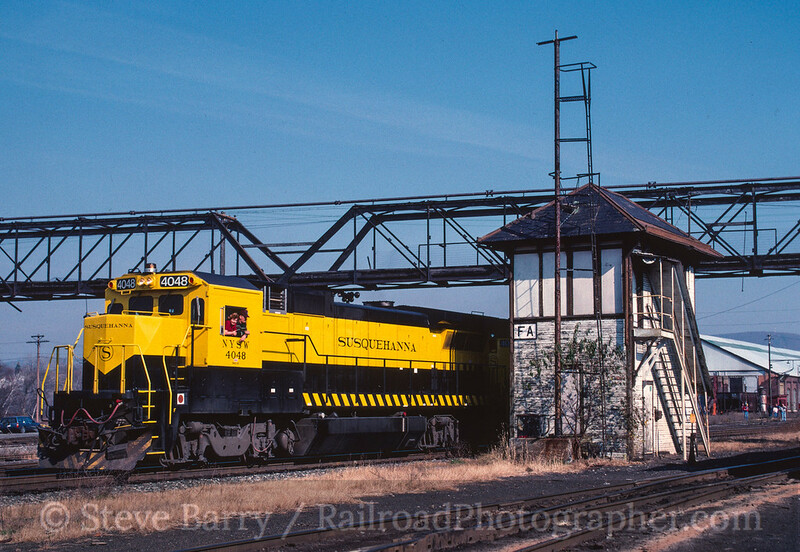 ran a fan trip over the Susquehanna's D&H from Scranton, Penn., to Oneonta, N.Y. At Oneonta the diesel power was run around the train for the return trip, pausing by shuttered FA Tower for a photo opportunity. FA Tower was eventually dismantled and now sits in kit form just northeast of Oneonta at the Cooperstown & Charlotte Valley Railroad, awaiting reassembly. Once again we are in April and spring has not sprung in the Hudson Valley. 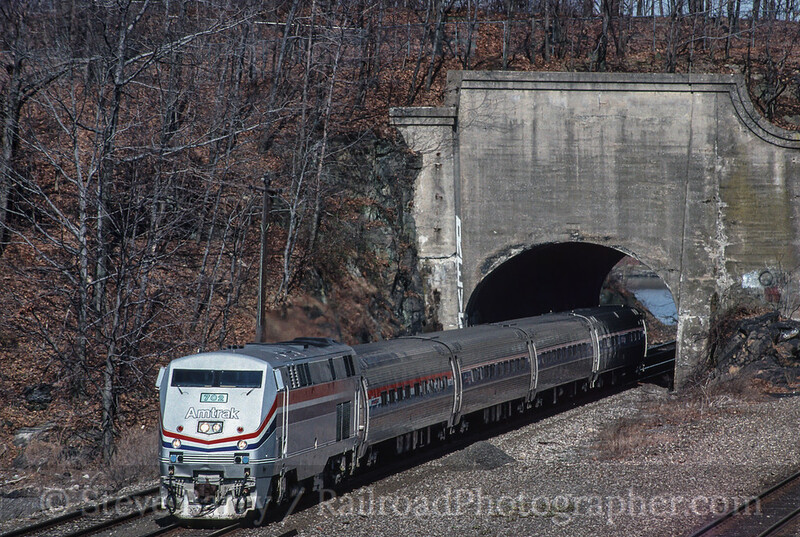 We're at Oscawana Tunnel just north of Croton-on-Hudson on April 3, 1997, as a southbound Amtrak train emerges from one of the two side-by-side bores here. The locomotive is wearing what has become known as the Phase III Amtrak paint scheme; Amtrak has brought this scheme back on one of its locomotives for its 40th anniversary in 2011, but few remember that the original Phase III had a silver front; the modern reincarnation has a black hood which provides less glare for both crew and photographers. We'll finish our tour with something completely different. 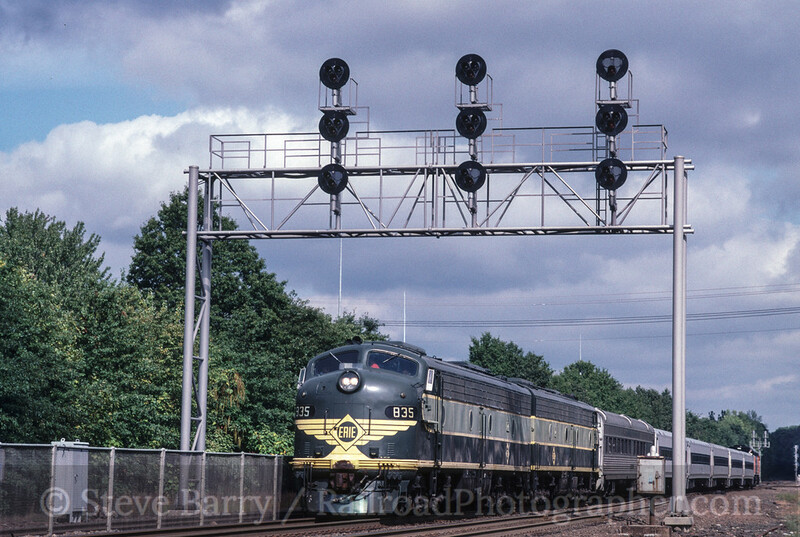 The United Railroad Historical Society of New Jersey restored a pair of E8 streamlined passenger diesels into the paint scheme of the Erie Railroad (the diesels are actually former Pennsylvania Railroad and Baltimore & Ohio, if memory serves me correctly) and operated them on fan trips to raise funds for a proposed railroad museum in the Garden State. Running all over New Jersey Transit, the pair ran several trips including this one on September 19, 1998, that took the locomotives just across the state line into New York. And that concludes our tour of southeastern New York via Kodachrome. Thank for coming along! Amazing how much time has changed. Your high quality shots really make me nostalgic. Nice stuff.